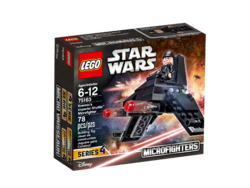 75163 Krennic's Imperial Shuttle Microfighter is a Star Wars Microfighter released in December 2016. Fly in style with Krennic’s miniature Imperial Shuttle! 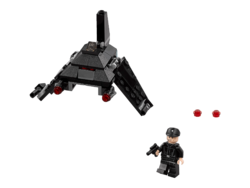 Recreate mini Star Wars: Rogue One adventures with Krennic's Imperial Shuttle Microfighter, featuring folding wings, two stud shooters and space to seat the included Imperial Shuttle Pilot with his blaster pistol. Facts about "75163 Krennic's Imperial Shuttle Microfighter"